Since the rollout of this update, website rankings in mobile searches have been shifting. If your website is already mobile-optimized, this can be great for your SEO strategy, and your website may have already seen an increase in its ranking. However, if your site is not mobile-friendly, your site’s ranking could be taking a hit. In November 2014, Google started marking search results for websites as “Mobile-friendly” when searching from mobile devices, potentially steering mobile visitors away from websites that aren’t mobile-friendly. Google started these initiatives to make it easier for an ever-expanding mobile population to access information, and to encourage developers to move beyond static-width websites, and fully embrace mobile-friendly design. 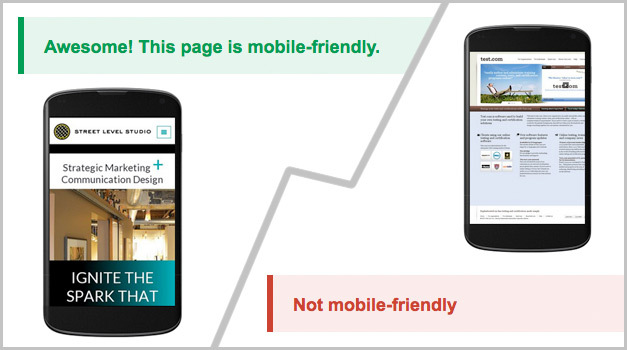 To see if Google considers your website to have a mobile-friendly design, test it with Google’s Mobile-Friendly Test. Enter a URL and it will return a report with the status of the webpage. If you would like more information about mobile-friendly websites using responsive design, contact us. We specialize in creating mobile-friendly websites that work across any device.